Well, my determined husband happened to be looking at Open Table one day and found a more reasonable reservation for us – (a random) Tuesday at 6:45 pm. With my sister free to baby sit (i.e. watch Kaiden sleep! ), we decided to go with it! 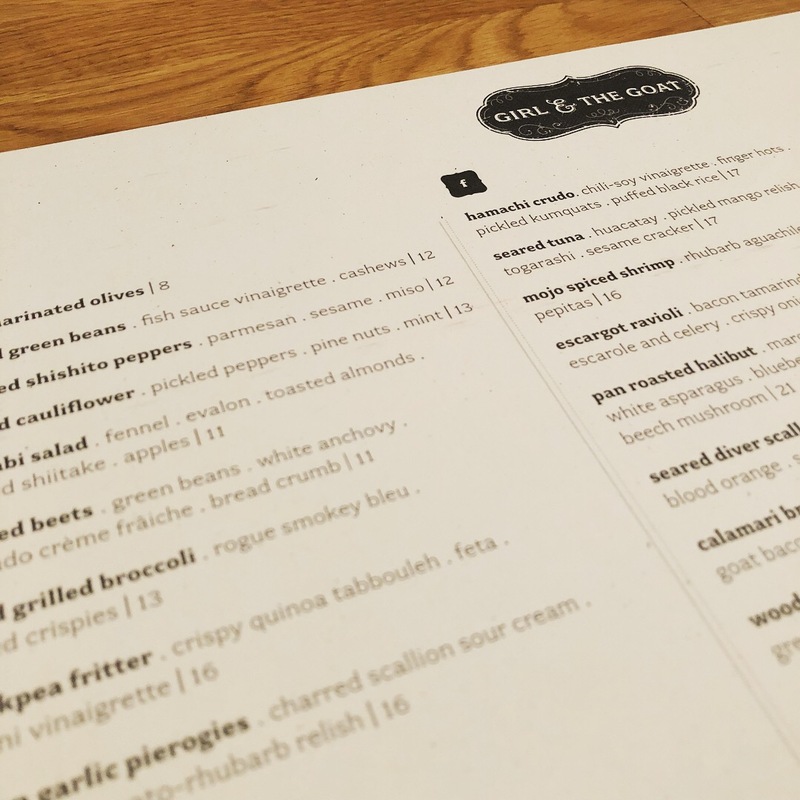 To be totally honest, I wasn’t expecting to love the vegetarian food at Girl and the Goat. Why? Mainly because they are known for the meat dishes. But let me tell you – I was blown away by how fresh, well-balanced, and truly delicious every element of our meal tasted. A feast to remember! 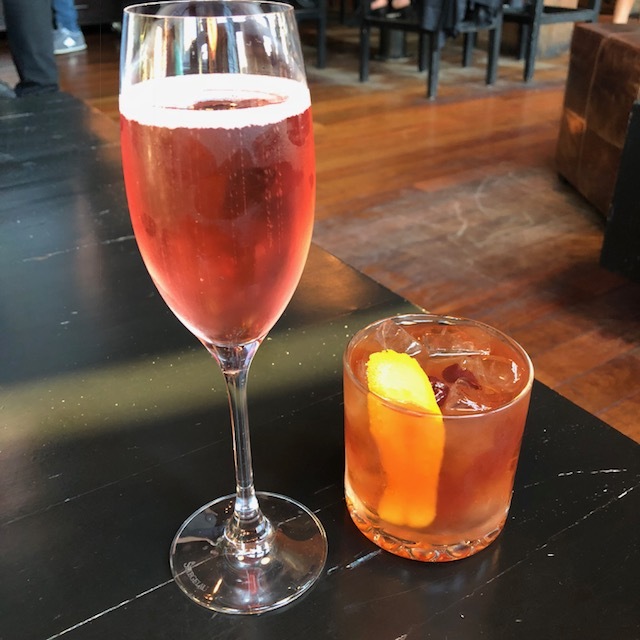 Vishnu and I started with drinks (sparkling rose for me and an old fashioned for him) and an order of the sourdough bread with a side of whipped feta and red onion mostarda (a creamy dipping sauce). My rose was on point, Vishnu loved his drink as well, but let’s talk about this whipped feta for a second. I need a tub of this by my side at all times. 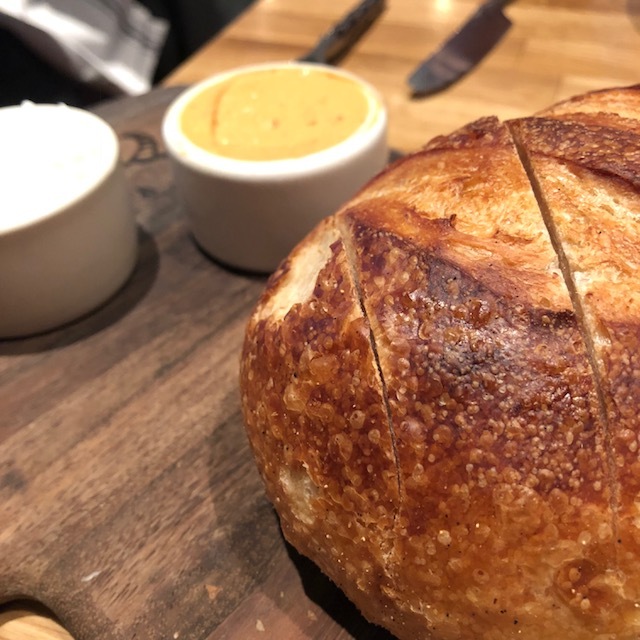 It was so creamy and tangy and the perfect spread for the crusty sourdough bread…and I’m sure anything else you can find that’s dippable. Vishnu and I decided to share one more vegetarian item before digging into our entrees. Based on a recommendation my friend Jigna shared with me, we ordered the roasted cauliflower. OH-EM-GEE! I’m totally ordering this as my main entree the next time we eat here. If you’re not a cauliflower fiend, you may be wondering what the hype is all about. You guys! 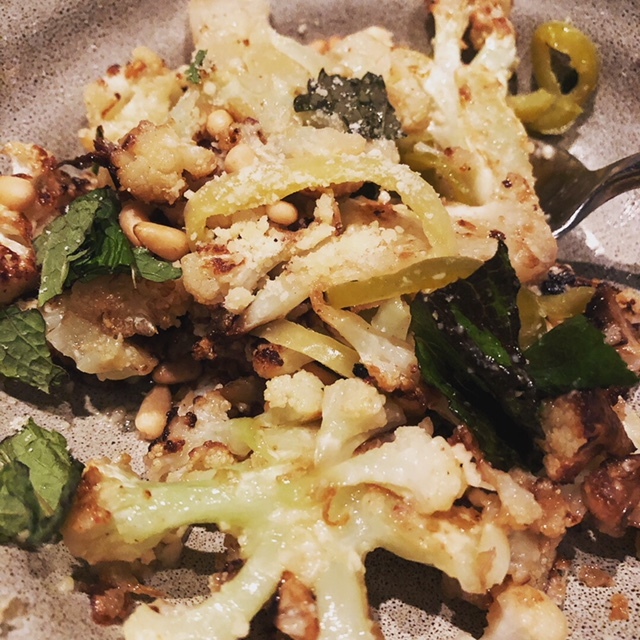 The char on this cauliflower…the tenderness…the pine nuts…and the pickled veggies and jalapenos. It all came together to form the perfect bites. I could not get over how tasty this little dish was! A must order in my humble opinion. For my main entree, I decided on the green garlic pierogies that came with a sour cream and scallion + tomato relish on the side. The portion size was definitely on the smaller side (4 pierogies per order), but it was the perfect amount for me given we ordered a couple of things to share. 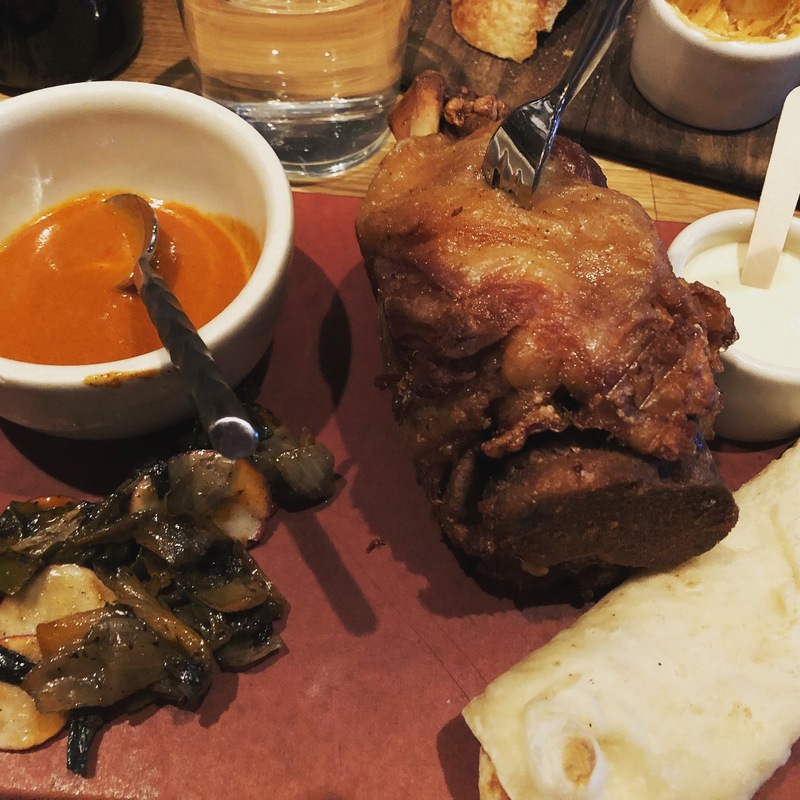 My favorite part of this dish was the sour cream sauce and the relish. 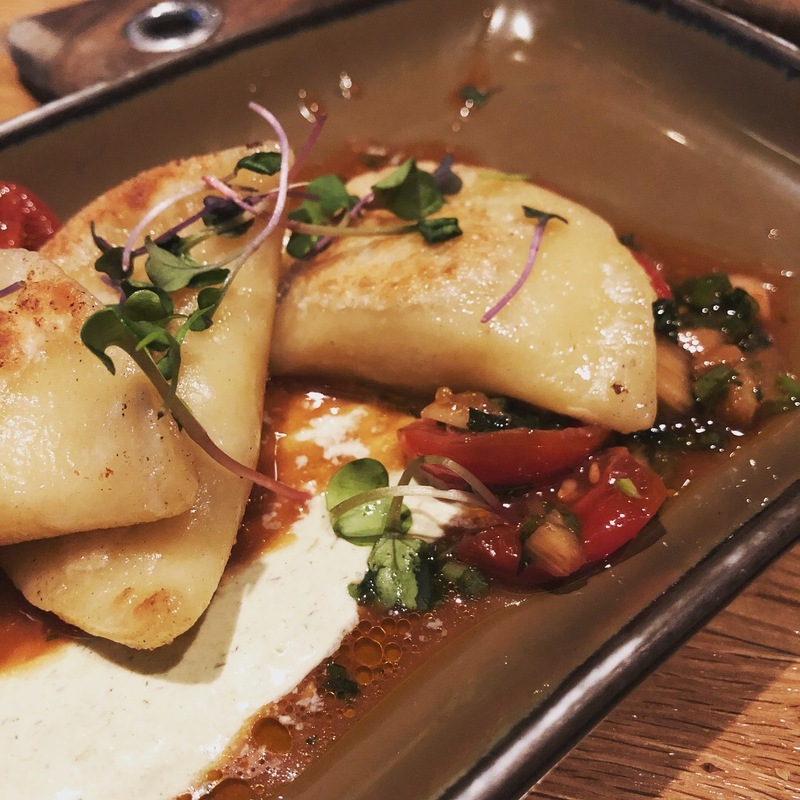 They paired so well together and when eaten with the tender pierogie and creamy filling, it was pure magic! For his main dish, Vishnu ordered the crisp braised pork shank. In his own words, this was the most tender pork he’s ever had. Super juicy too. I was able to try the dipping sauces and loved them both – the kimchi one was incredible…so unique! And the naan was the softest and fluffiest I’ve ever tried. I don’t think Vishnu regretted his choice by any means! Any finally, no meal out would be complete without a little something sweet! Vishnu put me in charge of picking our final course, and of course, I went for the one with all the chocolate. Our waiter even confirmed that it was the best one on the menu! 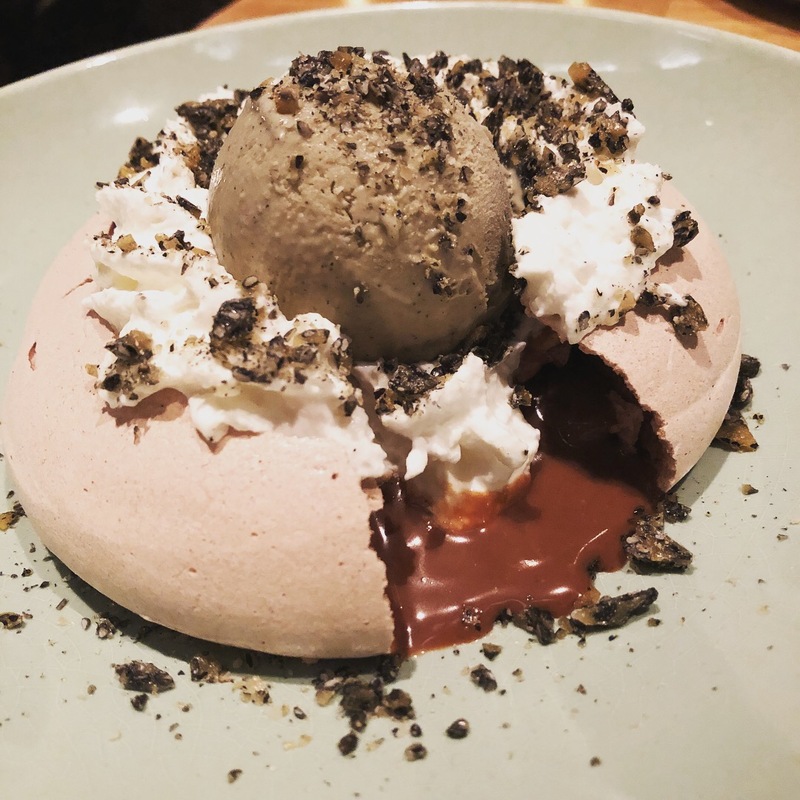 You guys, this chocolate pavlova with sesame whip cream, brittle, and ice cream was out of this world and SO unique. The actual pavlova was essentially one huge macaroon, and the crispy edges were everything! My favorite part (no surprise!) was the creamy chocolate caramel sauce. It wasn’t too sweet or even too chocolaty, but it really brought the whole dessert together. Girl and the Goat, we shall meet again…when Vishnu finds another random weekday reservation! But seriously, every Chicagoan/visitor needs to try this restaurant. AMAZING all around! This all sounds wonderful!! I have heard such good things about Girl and the Goat, glad you enjoyed!! You and Tom would LOVE it! Definitely try and go the next time you’re here. That looks delicious!!! I’ve never heard of this place until I just read your blog…I’ll definitely be checking it out now!!! Those pics of food look AMAZING! It’s a must try Chicago restaurant for sure!